For the last couple of days my head has felt like it was spinning, my stomach has been in knots, and my heart has been racing. 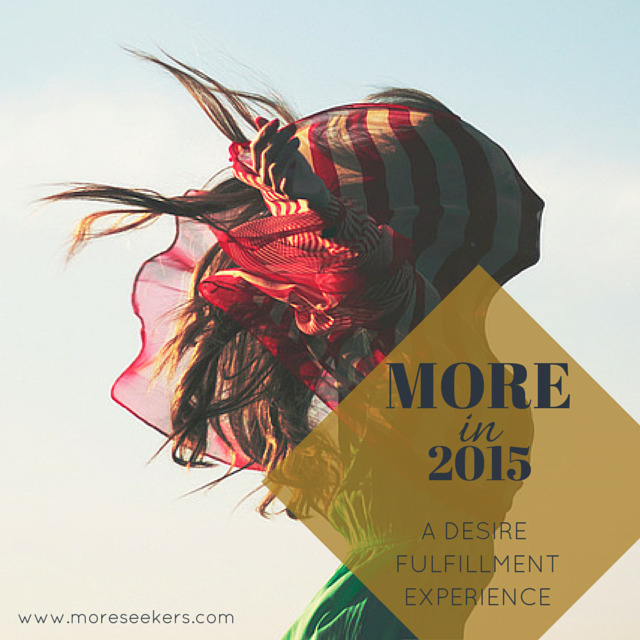 Granted I've been feverishly working on things I'm over-the-moon excited and passionate about like re-launching the website and making big plans for what 2015 will bring for both me and MoreSeekers, and despite all the good things I was creating, I wasn't quite feeling myself, I was more so feeling rather weird and discombobulated. So of course, I did what I normally do, what many of us probably do, and I went to work to find a solution to ease the uneasiness – I ran, hit my yoga mat, sweated, stopped eating sugar, and then finally on a little jaunt to meet a friend for lunch yesterday, the California sun shining down on me, it all started to melt away. As I lifted my face to greet the sun's warm embrace I was reminded, once again, solving the symptom wasn't the answer, and that the solution wasn't in what I was doing, it was in who I was *being*. (BE>LIVE>DO>HAVE). In total transparency 2014 wasn't one of my favorite years. In fact, it could definitely go down as one of the top five hardest years of my life. I was so ready for January 1. I didn't even really want to celebrate on New Years Eve. I just wanted to wake up the next day with a fresh start and new beginning. Which is exactly what I did, and I hit the ground running... hard, completely and totally forgetting that if I was going to create and generate my desires I was going to say goodbye not only to 2014 but also to the me that created my reality in 2014. Truth be told my incredible intensity and determination allowed me to accomplish a sh*t ton in the last week, but this is rarely if ever really how MORE works. When MORE is forced through action we often start to feel the not so comfortable sensations of anxiety, worry, etc. I was so wrapped up in the frenzy of the doing and the accomplishing my body started resisting, and literally started fighting back. I hadn't taken a moment to appreciate, clear out, bask, and adjust my sense of *being* so that I would be able to invite in the MORE I wanted, and as a result peace and grace were far from the experience I was having. And I for one definitely want a little peace and grace with my MORE. For the most part this is how MORE works – despite the fact that you want it, and you may want it really really badly, you need to create the energy that allows it to find you. In other words, be a beacon rather than a steamroller. It's easy to forget you don't have to go full out, all gung-ho into the new year. It's completely and totally OK to step into this first week, with a blip rather than a bang. The most important thing is do what makes you feel good. It doesn't have to be painful and you don't have to suffer to get what you want. I'll admit, this can absolutely feel like it runs counterintuitive to the action>result process most of us MoreSeekers have been taught, and have taken on as "our way". But when you think about it, it's not really all that different. You're simply changing the basis of your desire from forcing to inviting. Instead of giving yourself marching orders it's more like you're giving yourself permission to slip into the excitement, be a little flirtatious, allowing the new year to come and meet you so you can draw it in close and savor every fleeting moment rather than driving, pushing, grasping and forcing yourself into it. For many of us MoreSeekers this takes diligent awareness and practice - and maybe even a change in belief. Drawing MORE towards us requires an important decision – decide who you need/want to be in order to draw that which you dream and desire to you. This is seduction. And as I mentioned before, for most of us MoreSeekers it may not feel natural, at first. I like to start with identifying how I want to feel, but you can also identify an attitude or a state of being. Think adjectives rather than nouns or verbs. These are the energies that attract and magnetize. You can choose one word, or create a mantra, maybe even draw a picture or make a collage. Do whatever feels good, since that's the whole point, right?!?!? It's important to remember this is for you, and no one else. So if it's a little out there or maybe feels quite big and bold, that's super fantastic, go with it as long as it makes you feel alive, vibrant, and ultimately magnetic. This morning, in this moment, right now, I made the decision to seduce 2015. I let the anxiousness go, I washed it away with the sweat of my morning run, anchored into my core desired feeling for 2015, and made the conscious decision to not only feel, but to *be*, "Sublimely Rad" – for me this means being a beautifully, intoxicating, elevated natural coolness. SO much better. And the great thing is I don't really have to do anything to be this way, to be sublimely rad. I just have to decide that's me, it's who, what and how I am, and then let that energy radiate from my heart and soul. It might sound crazy, and totally counter intuitive to most, but I swear it works. With a little sincere pretending anything is possible, and already today is off to a MORE delicious, MORE peaceful, MORE graceful, and MORE accomplished start. And I wish you the same as this new year begins to take off for you - may you seduce in the new year and receive everything you desire with a healthy dose of peace and grace. PS: If you're ready to go deeper and learn a whole new way to practice goal setting and getting what you want, check out the new MORE in 2015 kicking off February 6-9 with an incredible retreat weekend at the exclusive Casa Shelter Half here in beautiful sunny Venice, California. And if you're interested in learning more about core desired feelings and how they work, pick up Danielle LaPorte's book, The Desire Map. Newer PostMORE for you on my birthday!